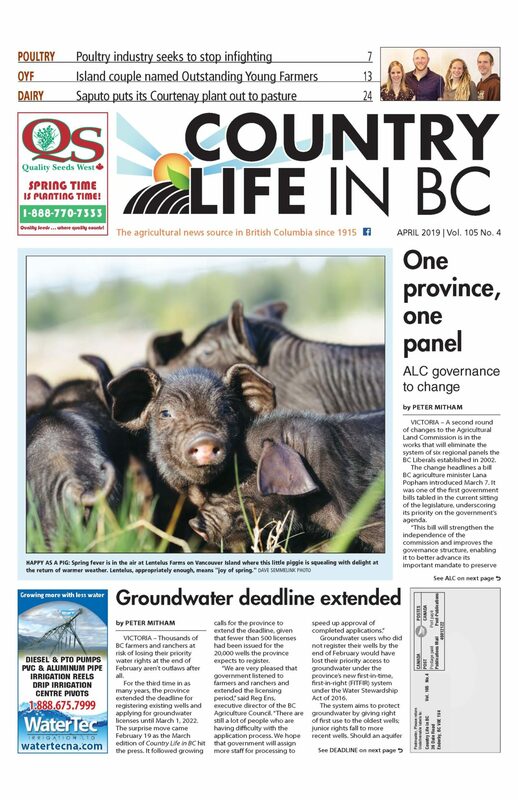 CHILLIWACK – After several years of lobbying, the BC hazelnut industry finally has a replant program. In mid-July, BC Minister of Agriculture Lana Popham announced $300,000 in funding over three years for a new BC Hazelnut Replant Program (HRP). The long-established industry was decimated by eastern filbert blight (EFB) in the past decade, leading most Fraser Valley orchardists to rip out their infected orchards. Seeing the writing on the wall, the BC Hazelnut Growers Association started a trial of new EFB-resistant varieties in six (now five) orchards in 2011, with a second planting in 2013. Developed in Oregon, the six varieties (Yamhill, Jefferson, Sacajawea, Eta, Theta and Gamma) are proving adaptable to BC conditions. Despite being in the shadow of highly infected orchards, most trees, particularly those planted in 2013, are doing quite well with only a few exhibiting signs of EFB. “Everyone’s glad to see the announcement. It gives the hazelnut industry a chance to revive and grow bigger than ever before,” says BCHGA president Neal Tebrinke. He believes the industry needs to generate a new grower group, noting many existing growers are older and unlikely to replant given the time it takes for a new orchard to come into full production. The HRP recognizes that, making the incentives available to both existing growers and new entrants. The program includes both removal and renewal components. The removal component will provide up to $1,800 per acre to remove an infected orchard. The renewal component will provide $5 per tree to a maximum of $1,345 per acre to plant new EFB-resistant trees. The first application deadline is August 31, and covers removals or plantings before December 31. Although there will likely be a few applications for removal funding, Tebrinke expects the short notice means few will be able to take advantage of the replant funding this year. “For anyone to replant this year, they would already have had to book their trees,” he points out. Tebrinke (Mountain View Acres in Agassiz) is one of three BC hazelnut tree propagators/suppliers. His inventory includes the six varieties in the BCHGA trial. Although he has enough trees for about 40 acres of new plantings this fall, he notes they are already committed. He is now taking orders for planting in fall 2019, and expects to be able to produce enough trees for another 50 acres of orchards. 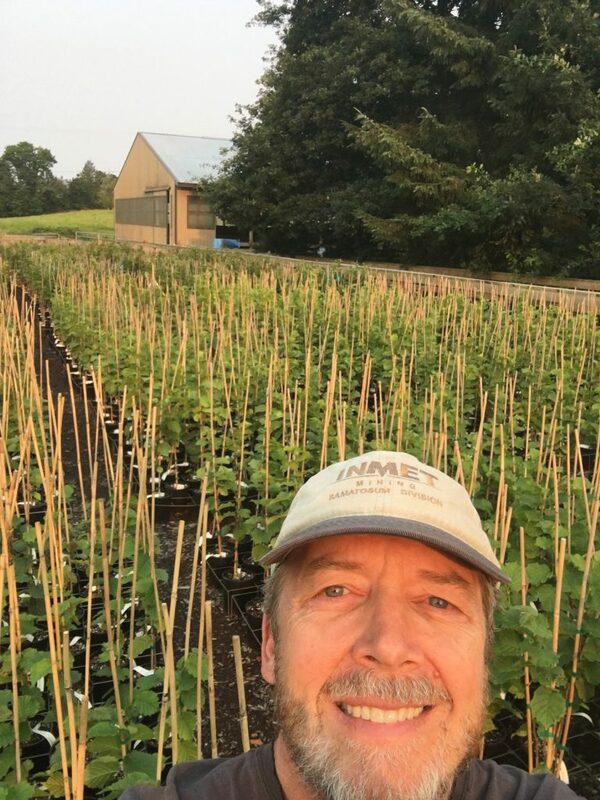 Thom O’Dell (Nature Tech Nursery of Langley) has co-ordinated the BCHGA trial since its inception and not only offers the six varieties in the trial but also sells Dorris, Felix and York, three newer, more EFB-resistant varieties from the Oregon hazelnut breeding program. Although most trees ready for planting this fall are already committed, he says “if the trees grow as they should,” Nature Tech will have a few trees available for planting either this fall or next spring. He expects to be able to fulfil all the demands he gets for plantings next fall. Mosterman Plants of Chilliwack is the newest entrant into hazelnut propagation and the only one licensed by the Oregon breeding program. As a result, they are offering only the newer, more resistant varieties being developed in Oregon. “We currently offer Dorris, Felix, York, McDonald and Wepster (Oregon’s most-hyped new variety) commercial varieties and Burgundy Lace and Red Dragon ornamental varieties,” Sylvia Mosterman says, noting their licence will allow them to offer other new Oregon varieties three years after they are made available to Oregon growers. All her trees are produced from tissue culture (as is also the case at Nature Tech), so “we can produce as many trees as needed” given sufficient lead time. For that to happen, growers planning to plant trees next fall need to place their orders by the beginning of December. “We know (the August 31 deadline) is short notice,” admits provincial berry and nut specialist Karina Sakalauskas. She says once the August deadline passes, the ministry will start accepting applications for plantings in the spring and fall of 2019. Tebrinke says there is a ready market for all the hazelnuts BC is able to produce and a lot of land available for growing trees. He urges anyone interested in learning more about the industry and its potential to attend the BCHGA fall field day to be held at the province’s receiving station, Fraser Valley Hazelnuts, on South Sumas Road in Chilliwack, September 22. A wealth of information is already available on the association’s new website, bchga.com. It will soon also include the BCMA’s new hazelnut production guide. “We expect to have the guide available by mid-August,” Sakalauskas says. She also encourages potential growers to research Oregon’s information on growing hazelnuts, saying it is very detailed and highly adaptable to BC. “Our production guide is based on the experience of Oregon growers,” she notes.